The Russian October Revolution in the autumn of 1917, and the defeat of Germany a year later meant that by the outset of the interwar era, Sweden's geopolitical situation was suddenly better than it had ever been since the Napoleonic Wars. Neither Soviet Russia, caught in a bloody civil war, nor the worn-out and defeated Germany could in any near future assert itself as the new ruler of the Baltic Sea. Furthermore, a row of new nation states – Finland, Estonia, Latvia, Lithuania and Poland – had appeared on the other side of the sea, constituting a buffer zone that shielded Sweden from Russian danger. At the same time, however, the situation had become more complicated. The habitual stability in the region, based on a balance between the great powers, had already been upset during the war and now disappeared completely. Instead of long-established empires and monarchies, Sweden now had to face new and shaky nation states, as well as the entirely unprecedented phenomenon of Communist Russia. The young Baltic states, deeply aware of their own weakness, were putting great hopes on Sweden. In autumn 1918, Estonian and Latvian politicians, supported by Great Britain, requested Swedish military intervention in the Baltics after the retreat of German regular forces and in the face of the Red Army offensive that was likely to follow. This was declined by the Swedish government with the argument that Sweden would not act independently of the Entente powers, even if it recognized it was also in Swedish interests to keep bolshevism as far as possible from the shore of the Baltic Sea. Subsequently, Baltic politicians tried their hand at recruiting Swedish volunteers to serve alongside Estonian and Latvian servicemen. Recruitment bureaus were set up in Stockholm, but owing to the lack of money and a wave of protests by the Swedish socialists, they succeeded in attracting only a limited number of volunteers, many of whom had been unable to find work after participating as volunteers on the white side in the Finnish Civil War. 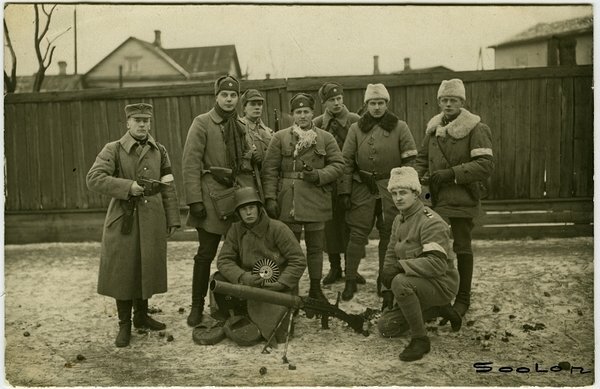 Not particularly interested in helping Estonian and Latvian national causes, most of them were motivated by money and mercenary adventurism, not unlike the German ex-soldiers who went on to join the Freikorps fighting in the Baltics. In fact, after it became clear that Estonian and Latvian governments could not supply the necessary finances, the recruitment bureaus were taken over by Baltic German circles who were very interested in hindering the spread of bolshevism, but not at all in propping up the national democratic governments. On the contrary, there are indications that they wanted to use the Scandinavian volunteers to overthrow them. 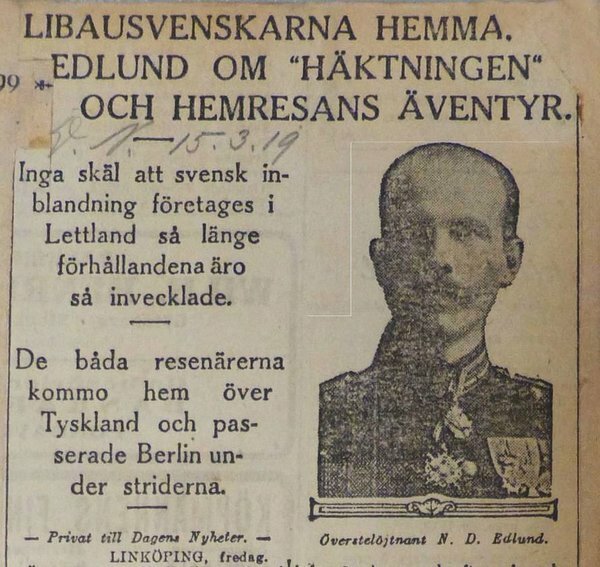 The Latvian initiative ebbed out by the early spring of 1919, but not before the former Livonian Land Marshall Heinrich von Stryk and the Swedish General Staff officer Nils Edlund had been arrested in Latvia with highly incriminating papers containing the intervention plans. The few Swedish volunteers who did arrive to Estonia – around 300 out of the originally intended 4000 – quickly made themselves known not for their military prowess, but a series of scandals culminating with a Swedish lieutenant being executed by his own comrades after a war tribunal of questionable lawfulness. This episode was widely reported in Swedish newspapers in the summer of 1919 and investigated by both Swedish and Estonian authorities. In hindsight, it seems that there was indeed some potential for Swedish military intervention in the Russian successor states following World War I, exemplified by Sweden’s officially sanctioned Åland adventure in early 1918, as well as the unofficial recruitment of Swedish volunteers into the Finnish Civil War and the Baltic Wars of Independence. At least as far as the latter is concerned, anything similar has been completely out of question both before and ever since. But even then, the Swedish government’s refusal to offer its support – understandable though it might be, given the domestic political situation – undermined the recruitment effort to the degree it is hard to see it as anything but a complete and utter failure, doing nothing but perpetuating an image of the Baltic states as a sort of wild east where nothing but misfortune awaited.